You've used the Stallion Register Online. You know the basics. It's a free service... you can do a multi-criteria search from the home page... stallion pages have tabs for easy navigation... there are a bunch of state and national sire lists... the annual Report of Mares Bred is linked directly from the home page. Comparison tool: Starting on the home page - or on any stallion's feature page - you can choose two or three stallions to compare side-by-side. Just select the names from the drop-down menu and submit - you'll see a neat matrix that lets you quickly compare statistics between sires. Advanced Search: Underneath the basic Stallion Search on the home page - or at the upper right of most other pages - you'll find a clickable "Advanced Search" link. Use it! You'll be able to search by grandsire and/or broodmare sire, by year entered stud, or by dam -- in addition to the standard search criteria. TrueNicks or hypothetical matings: Want to see how your mare crosses with a particular sire? 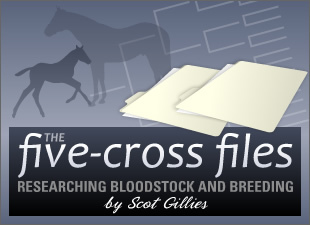 Free hypothetical matings (and, for sponsored stallions, free TrueNicks reports) will let you see the five-cross pedigree. Better than similar services elsewhere - these pedigrees are created using The Jockey Club's official registry database. equineline.com Statistical Summary: Need to know how many foals, winners, or stakes performers a sire has? What about progeny average winning distance? AEI and CI? Average earnings per starter? Access these free equineline.com summaries on individual stallion feature pages. Recent Winners and Stakes Performers: One of the tabs on the stallion feature pages will bring you to a list of the sire's most recent progeny headliners. You'll find clickable links to the runners' pedigrees and recent sales information -- and you can view the horses' Equibase charts free! If the runner's recent win was a stakes contest, the SRO page will also include a stakes chart (and a short write-up from the magazine when applicable). The Blood-Horse's Free Index of Thoroughbred Stallions: Did you know you can submit a free listing if you stand a stallion at your farm? 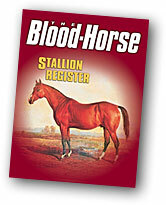 ... That Free Index stallions appear both online and in the printed Stallion Register? ... And that inclusion in this database is required for stallions to appear on regional sire lists? Don't put it off -- register your stallion(s) today. Within a couple of months, you'll be poring over the stallion selections for the 2009 breeding season. Take a minute now to familiarize yourself with these additional search tools!